It’s sometimes criticised for being way too conservative and stuck in its ways, but sometimes – just sometimes – Scotch whisky creates some truly crazy products. Gavin D Smith takes a walk on the weird side. Sometimes it can seem that the world of Scotch whisky is a place where radical innovation is rare, partly due to the very strict regulations that govern its production. Nonetheless, over the years a number of distillers and bottlers have sought to offer consumers something just a little bit ‘different’. As we shall see, the results have been somewhat mixed, but they’re almost always entertaining. Arguably the most famous – or perhaps infamous – Scotch whisky innovation was 10-year-old Loch Dhu. It was launched on an unsuspecting public by United Distillers, the precursor of Diageo, in 1995 and seems to have acquired something approaching cult status in the years since. The whisky was distilled at Mannochmore on Speyside and aged in double-charred casks to give it a distinctive black colour, perhaps enhanced by a few drops of spirit caramel. ‘Dhu’ is Scots Gaelic for black. Loch Dhu’s reign was relatively short, but bottles can still be acquired from loch-dhu.com, as well as at auction. At the opposite end of the colour spectrum to Loch Dhu was Jackson’s Row. Described on its label as ‘All malt bond Scotch whisky’, this was also a result of United Distillers’ attempts to make whisky appeal to a younger audience – an elusive goal which must have cost many marketing departments many millions of pounds over the years. Jackson’s Row was introduced at the same time as Loch Dhu, and comprised young Glenkinchie spirit, distilled in East Lothian and aged in casks that had previously experienced several fills. Despite the fact that only 1,800 bottles were produced, Jackson’s Row is remarkably affordable at auction. J&B -6 was spawned by the same urge to make Scotch appeal to young consumers, but a decade on from our first two entries. Clearly aimed at vodka drinkers, this variant of the esteemed J&B Rare – which dates back to the early 1930s – was created by what had now become Diageo and hit the shelves in 2006. Almost vodka-like in clarity, J&B -6 was chill-filtered to minus six degrees (hence the names) to remove much of its whisky flavours. Despite its obvious similarity to vodka, youthful imbibers were not swayed, and J&B -6 was withdrawn from the market after only a year, in 2007. In 2005, independent whisky maker John Glaser of Compass Box launched The Spice Tree, a blended Highland malt partly finished in casks that had additional, 195-year-old French oak staves suspended inside them. The technique, similar to those sometimes used by winemakers, accelerated the effects of ageing, but the Scotch Whisky Association (SWA) deemed it unlawful, and threatened Compass Box with legal action. Glaser was compelled to withdraw The Spice Tree from the market in 2006. Not to be beaten, however, a new version of The Spice Tree soon appeared, this time aged in specially made casks with new French oak heads. This new expression was considered acceptable by the SWA. Launched in 1987 as part of a diversification process led by William Grant & Sons’ new product development team, Auld Alliance was described as ‘an original marriage of malt Scotch whisky with finest French Armagnac’. The name came from the strong historic bond between Scotland and France, and Grant’s described its new fusion as ‘…best enjoyed on its own to complement an excellent meal, or as a satisfying end to the day’. The same new product development team also toyed with a drink called Bourbon Street, made with Scotch whisky, Bourbon and walnuts. At a time when Bruichladdich seemed to launch a new expression almost every week, Flirtation hit the headlines for its unusual colour. Variously described as ‘bright pink’ and ‘rosy-hued,’ the 20-year-old single malt was launched in 2004, having spent five weeks in Mourvèdre wine casks. Then ’Laddie CEO Mark Reynier refused to use the term ‘finishing’ and instead described such whiskies as having been ‘ACED’, or having undergone ‘Additional Cask Evolution’. Reynier insisted that the colour of what became known as Flirtation was entirely accidental – and not, as some suspected, a gimmick designed to appeal to female drinkers or court the ‘pink pound’. In 2002, the Scotch Malt Whisky Society (SMWS) launched a product called Hotscotch Sauce, described as ‘a demonically fiery cooking spirit’. What many people did not realise was that Hotscotch – also known as The MD’s Folly – started out as a whisky, after SMWS managing director Richard Gordon decided to have four casks finished in barrels previously used to ferment and mature the famous Tabasco Sauce. This produced whisky which proved challenging to drink, to say the least, hence its ultimate release as a condiment. Undeterred by this cautionary tale, the US recently saw the launch of George Dickel Tabasco Brand Barrel Finish. Possibly the most bizarre whisky ever offered for sale, Fishky was a single cask Bruichladdich finished in a Sherry cask that then underwent a secondary period of finishing at the hands of its German owners. For reasons known only to themselves, they chose an ex-herring cask for this purpose. Mark Gillespie of whiskycast.com described Fishky – bottled in 2007 at 50.2% abv – as ‘by far the worst whisky I’ve ever tasted… The nose hides the secrets of this whisky well, with notes of malt, brine, and heather. Huxley is part of Diageo’s latest bid to push the whisky envelope and can be seen in the great tradition of Loch Dhu, Jackson’s Row and JB -6. It was released under the Whiskey Union banner in 2015 and is described as ‘pioneering hybrid whiskey drawing on some of the finest drams from across the globe, to create an ingenious blended whiskey surpassing the sum of its parts. 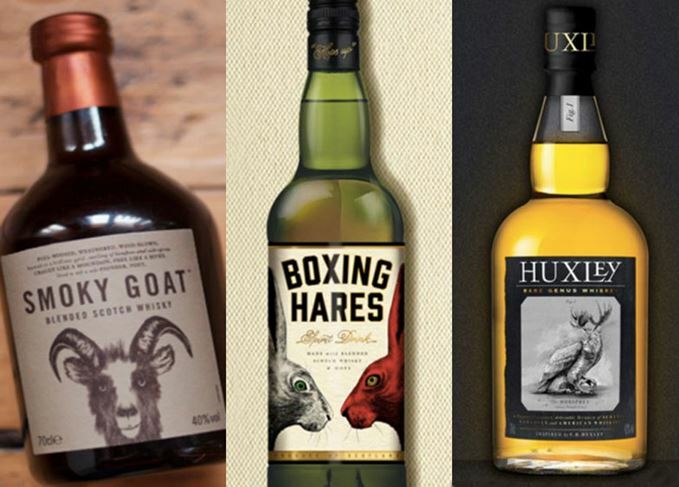 The second of the trio of releases with which Whiskey Union was launched, Boxing Hares is a ‘spirit drink’, combining Scotch whisky – probably Cameronbridge grain - with speciality hops more often used in craft beers. By contrast with Huxley and Boxing Hares, the third Whiskey Union release seems quite mundane. Smoky Goat (£32) is a blend of grain, Highland and Islay malts, ‘…with a deep smokiness and rich sweetness’.